The drive west from Terrace toward Prince Rupert continued to be just as dramatic as the previous day’s journey. I never seem to tire of beautiful, snow-capped peaks and swift-flowing rivers, even if they are muddy and overflowing their banks. The mountains seemed to be even closer to the highway, and it was easy to spot the many waterfalls that were cascading down the rock faces. We were only 90 miles from Prince Rupert, so it was an easy day – perfect for our last push before boarding the ferry to Alaska. Approximately 25 miles or so from our destination, we were traveling at sea level. The Skeena River opened up even wider as it came closer to the sea. We were somewhat amused when we saw a sign for a chain-up area. That seemed odd – I thought we would remain at sea level for the rest of the way. There was one last hill to climb, however, although the Rainbow Summit topped out at just 525 feet. Although we had passed numerous chain-up areas since leaving Prince George, there were very few steep climbs or descents. Most were actually quite gradual and easy for any RV to negotiate. Since we would be arriving in Prince Rupert early in the day, we decided to stop at the North Provincial Cannery, a National Historic Site, for a tour. It had been quite some time since our last museum or historic site visit, and I was feeling the need for some culture! The cannery is located in nearly Port Edward and is the area’s largest tourist attraction. Established in 1889, the North Pacific Cannery is the oldest intact salmon cannery on the west coast of North America. There were once hundreds of salmon canneries along the coast of British Columbia and Alaska, but only a few remain in operation today. The remainder have been abandoned, burned or left to rot in the rain forest. It is quite amazing that North Pacific Cannery was preserved before suffering a similar fate. When we arrived, we were the only visitors. We paid our entrance fee and had our own private tour of the cannery. The salmon canning process was not just an industry, but a way of life. Part of the tour explored the industrial buildings, workspaces and equipment, and we followed the evolution of the industry from the early days of manual labor to the mechanized process that was made possible with new technologies. The entire cannery is built on pilings, and boardwalks connect the various buildings. Because the cannery was so isolated, workers of First Nations, Japanese, Chinese and European descent lived on-site in separate ethnic enclaves. Each group performed specific duties and had different styles of housing. This multicultural, but segregated, arrangement was characteristic of most of the early canneries in British Columbia. Our guide was a First Nations woman with a family connection to the site. I especially loved hearing stories of her family, especially her grandfather, who was a commercial fisherman whose family lived in a house similar to the First Nations houses that we toured. She personalized the tour, and that made it much more special for us. I would highly recommend a visit. 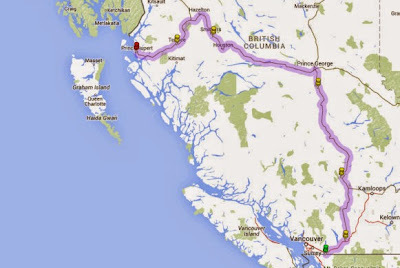 After the tour we drove into Prince Rupert and stopped at Tim Hortons for our Wi-Fi fix. While we were there Tim opened an email from the Alaska Marine Highway System notifying him of a schedule change. We have been closely following the news about cutbacks in ferry service, but hadn’t thought we would be affected since the reduction was scheduled to start on July 1. Luckily, the change was not a big deal. Instead of leaving Prince Rupert at 6:30 am, we would now depart at 11:00 am. Much more civilized, since we have to arrive three hours before departure. We checked into the only campground in Prince Rupert, the Prince Rupert RV Campground, and decided to stay for two nights. We had originally planned to camp at the ferry dock prior to our early morning departure, but decided that would not be necessary anymore. We have taken advantage of our extra time here to do laundry and catch up on a few odds and ends. We have blazing fast Wi-Fi here (it’s not the campground’s, but we’re grateful to whatever entity is providing it!). It’s actually been nice to just sit still after the long drive through British Columbia. Tomorrow morning we board the ferry for Alaska. Thanks for keeping up with us. Tim said that you got a new phone. How's that working out for you? We really did luck out with a postcard perfect day! Thanks for continuing to travel with us.